Gem and Jewellery industry currently employing 4.5 million and as per survey by NSDC and ICRA, there will be requirement of additional 4 million people in next 10 years. In the Gem & Jewellery Industry four major bodies have joined hands to formulate the Gem & Jewellery Skill Council of India (GJSCI). Preparing a catalogue of types of skills needed in the Jewellery industry. 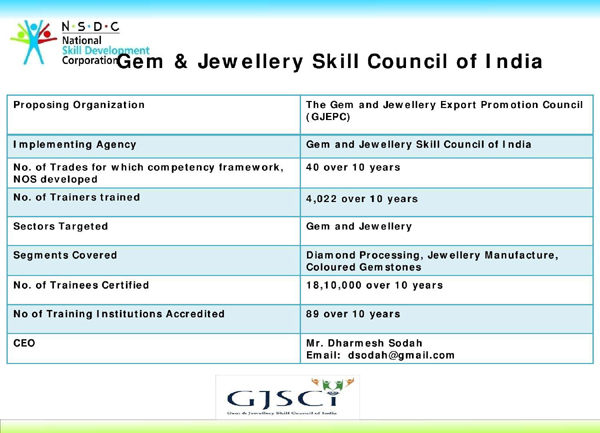 Preparing a skill development plan for the Gem and Jewellery sector. Affiliation and accreditation process of the institutes imparting training in the Gem and Jewellery industry. Participation in examination and certification of individuals undergoing training. Planning and execution of Train the trainer programs. Establishing Academies of Excellence in the sector. Address : Gem & Jewellery Skill Council of India, Business Facilitation Centre, 3rd Floor Seepz Special Economic Zone. Andheri (E). Mumbai 400 096.